Many of the country’s most vulnerable African-American children and youth are not benefitting from afterschool and summer learning programs, which help students succeed in school and in life, because there are not enough programs to meet the demand in communities of concentrated poverty (CCPs). Recently released by the Afterschool Alliance, America After 3PM Special Report: Afterschool in Communities of Concentrated Poverty finds that 27 percent of African-American children living in CCPs participate in an afterschool program – but 71 percent of those who do not would be enrolled, if a program were available to them, their parents say. The study is based on responses collected for America After 3PM from 30,709 U.S. households, including in-depth interviews with more than 13,000 parents and guardians – 1,499 of whom are African-American. CCPs are neighborhoods, or groupings of neighborhoods, in a community where there is a high concentration of families that live below the federal poverty line. The government defines poverty as family income below $24,300 for a family of four. In 2010, the families of 45 percent of African-American children in this country lived in CCPs. • Overall, 24 percent of African-American students in the United States today participate in an afterschool program. Twenty-seven percent of African-American children living in CCPs, 24 percent of all children living in CCPs, and 18 percent of all children in the United States participate in an afterschool program. 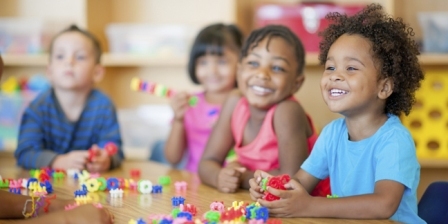 • An overwhelming number of African-American parents living in CCPs whose children are enrolled in afterschool programs (92 percent) say they are satisfied overall with their child’s program. • Eighty-three percent of African-American parents living in CCPs agree that afterschool programs help working parents keep their jobs. • More than seven in ten African-American parents living in CCPs (73 percent) report that finding an enriching environment for their child in the after school hours was a challenge. • More than half of African-American parents living in CCPs who did not enroll their child in an afterschool program (51 percent) report that cost was a very important factor in that decision. • Families in CCPs look to afterschool programs as a source of support to help meet every day needs, much more than families living outside these communities.